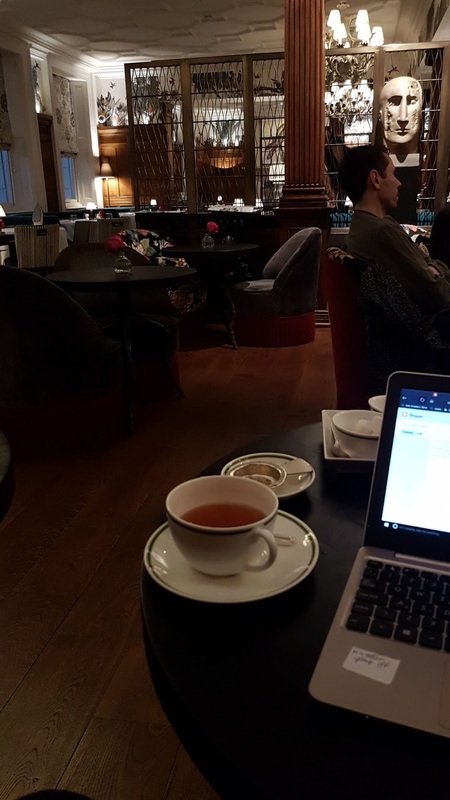 I like to write in different places, cafes, libraries, hotels. today I'm trying out hotels. 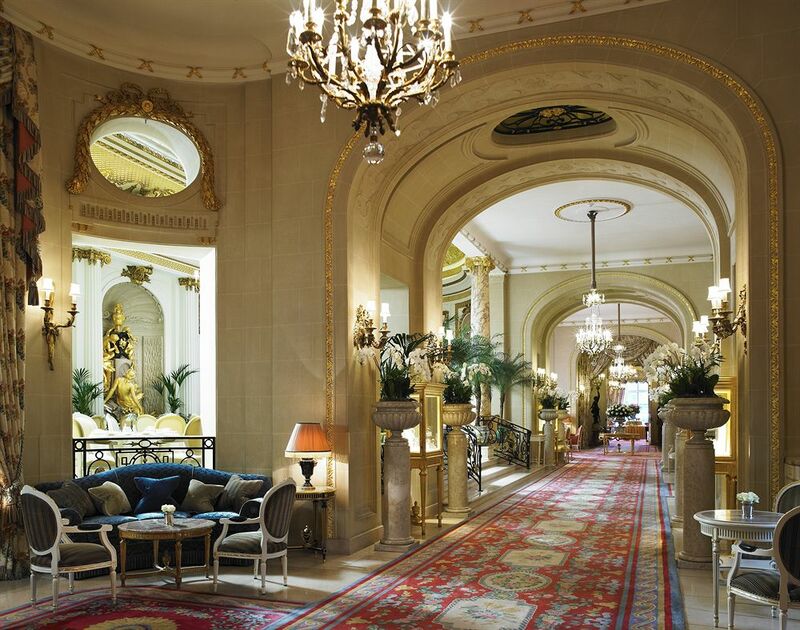 I tried the Ritz first, after a short stroll in Green Park with lovely autumn trees against a bright blue sky. 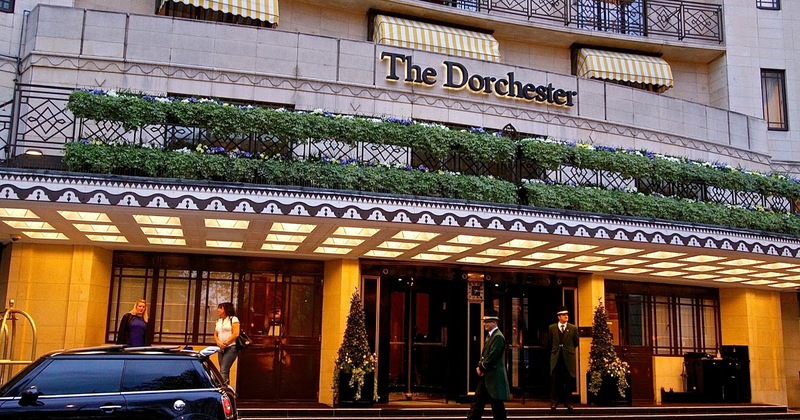 First you walk in through a side entrance and two liveried doormen check you out. 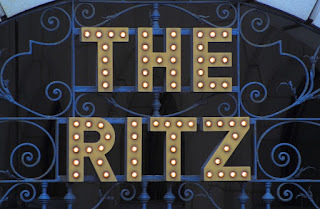 Once inside the Ritz, I walked into the café/bar area and got told off for my 'dress code'. This apparently referred to my shoes - black trainers. 'Sports shoes' said the Polish Bar Manager with distaste. 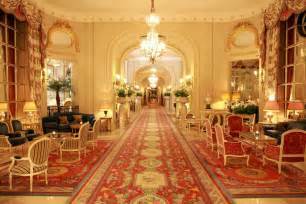 It was very busy in the main hallway inside with lots of gold regency furniture. I walked up and down - all the same ornate style with lots of curly bits. I would have stood out like a sore thumb in my black leggings, mini skirt and the offending black trainers. Everyone looked quietly opulent. Me with my battered old laptop, penchant for sitting cross legged on the furniture and table scattered with papers. There was no where to sit where I would have felt comfortable or relaxed. There was no where to sit where there wasn't a 'dress code'. In other words they didn't want riff-raff like me in there. The feeling was mutual. So I left. I walked down the road to Brown's Hotel, as I'd been reading Stephen King's memoir 'On Writing', (again) the day before. Mr King tells the story of how he wrote Misery. Bear with me it involves Browns. On the plane over from the USA with his wife (First Class I assume), he fell into a deep sleep and had a vivid dream about a writer who'd gone off to write in a cabin in the wilds, breaks his leg and gets trapped there with an over zealous and increasingly sinister female fan. Sounds familiar? Anyway he scribbled a note of it on the back of a napkin before they got off the plane. He and his wife got a cab into London and went to stay in Browns. '... on our first night there I was unable to sleep ……. a lot of it was that airline cocktail napkin.... I thought it was just too rich not to write. I got up, went downstairs,and asked the concierge if there was a quiet place where I could work longhand for a bit. He led me to a gorgeous desk on the second-floor landing. It had been Rudyard Kipling's desk, he told me with perhaps justifiable pride. I was a little intimidated by the intelligence, but the spot was quiet and the desk seemed hospitable enough; it featured about an acre of cherrywood working surface, for one thing. Stoked on cup after cup of tea (I drank it by the gallon when I wrote … unless I was drinking beer, that is), I filled sixteen pages of a steno notebook. I like to work longhand, actually: the only problem is that, once I get jazzed, I can't keep up with the lines forming in my head and I get frazzled. When I called it quits, I stopped in the lobby to thank the concierge again for letting me use Mr Kipling's beautiful desk. 'I'm so glad you enjoyed it,' he replied, He was wearing a misty, reminiscent little smile, as if he had known the writer himself. I went back upstairs to catch a few hours' sleep, thinking of how often we are given information we really could have done without." So there I was, I walked into Brown's - nice decor, nothing showy, lots of the colour brown to live up to it's name. Muted décor. I found this quiet under-stated ground floor bar area, found myself a warm quiet corner and got out my laptop. No poncy, liveried barmen or women looking down their noses at me this time. Pleasant helpful staff - one appeared by my side, I ordered tea - a silver pot arrived, she poured out the tea through a silver strainer, into my cup. Then disappeared and didn't bother me again. My laptop - wouldn't you know it - the battery was dead. The Italian girl at the desk plugged it in for me, by her desk and I told her the Stephen King story. She called the bar manager [Polish] who was fascinated, told me how she spent too much time these days on social media instead of reading books. She took me to another young woman, a neat and attractive brunette. The famous desk I was looking for, had apparently now been moved to an upstairs suite. This turned out to be occupied, but that young woman insisted she would go up there when it had been vacated and take a picture of the desk and email it to me. 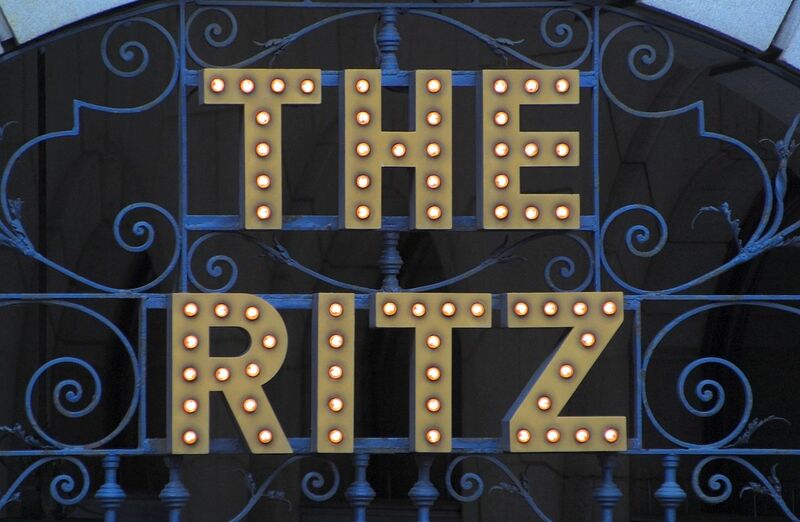 What a difference to the Ritz. The staff were lovely at Brown's and I sat there at my laptop for several hours with one pot of green tea in a silver teapot - no one bothered me - and munched my way through the sugar lumps .... oh dear. As soon as I get the photo of this famous desk, I will add it to this blog and won't that be interesting? As for Browns, well it was a lovely place to write on a cold winter's day. 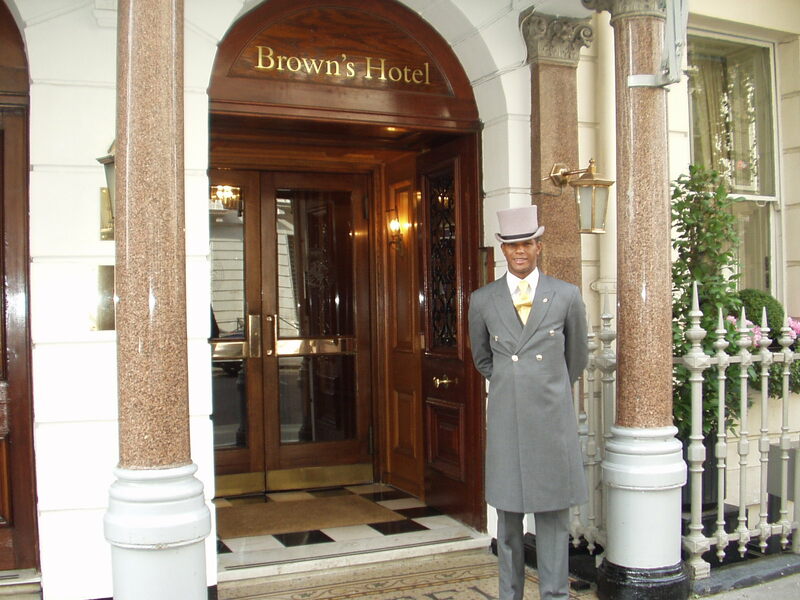 The staff were all friendly, helpful and accommodating. Definitely recommended. Although that pot of tea was £8! I'm writing this a few days later, yes, dear reader she did email me a photo of the desk. How kind but what a disappointment. Rudyard Kipling died in 1936, Stephen King wrote Misery and published it in 1991 ish. You'd expect such a desk to be a heavy old fashioned oak(?) affair with ink wells etc??? Well Stephen King describes it as 'gorgeous' and 'it featured about an acre of cherrywood working surface'. The photo the Browns' staff member sent me - no no no. This desk is a thin plain black slab on dull functional legs with boring chairs. I'm not even going to post it up for you. It's just too dreary. I've written back to her and thanked her for her kindness in remembering my request, but challenging the desk pic ... it can't possibly be can it? I shall write again and tell her what Stephen King said. 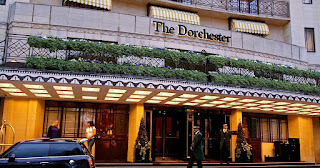 Now I wonder how much they charge for a pot of tea at Claridges and The Dorchester? And then there's the Savoy .... and the Hilton and the Grosvenor Park. Am I setting my sights too high?